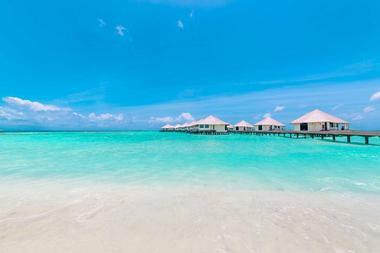 The tropical nation of the Maldives is the vacation destination that people dream about, made up of over 1,000 islands and atolls in the Indian Ocean. These islands are packed with resorts, which can provide visitors with the experience of a lifetime, from snorkeling amongst the coral reefs to enjoying a romantic candlelit dinner on a secret private island, where only one couple is allowed to stay at a time. Resorts in the Maldives range from intimate and romantic, with special events and packages for couples, to family friendly, with kids’ pools and plenty of activities to keep everyone entertained in this tropical paradise. 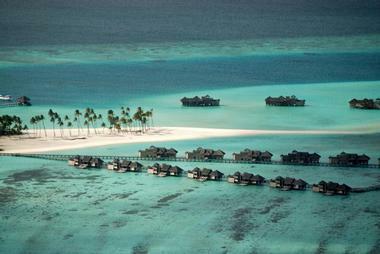 Cocoa Island by Como is a romantic, luxurious resort located on a small, private island. All rooms have an ocean view and many different amenities, such as an iPod stereo or a Nespresso machine. Since there are no kids' facilities or activities, there are few children at the resort. Guests can enjoy free sports activities and free daily yoga classes. There are half-board and full-board dining packages available, but there are no all-inclusive packages that include alcohol. Food, drinks, and the spa might be a little bit pricey for some, and the restaurant and bar charge for water. Constance Moofushi is an all-inclusive resort with a stylish private airport lounge at the seaplane terminal. An ice-cold welcome drink is just one of many thoughtful touches guests will experience during their stay. Room service is only available during breakfast, but there are two restaurants on the island. Both restaurants have a children's menu and are ready to satisfy all the requirements of guests who need special nutrition. Babysitting services are available for any guests who come here with their kids and want to spend some time alone in the modern gym or at the beach cinema. Lily Beach Resort and Spa is a kid-friendly resort located on a private island, only a 25-minute seaplane flight away from Malé International Airport. The well-equipped Turtle Kids’ Club offers a wide range of indoor and outdoor activities for children, which will keep them laughing and entertained for hours. While the kids are hunting for treasure or taking part in one of the many offered watersport activities, adults can indulge in luxurious treatments in the Tamara Spa. All villas are available only with the Platinum Plan, which covers all meals, a wide variety of both hard and soft drinks, four brands of cigarettes, and most activities and excursions. 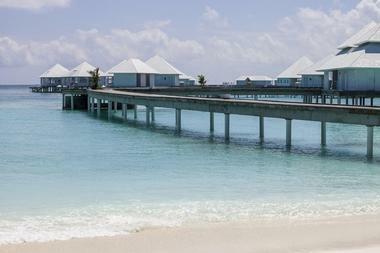 The Adaaran Prestige Water Villas resort is located on a private island, shared with Adaaran Select Meedhupparu. Visitors to the island will need to catch a 40-minute flight from Malé International Airport. 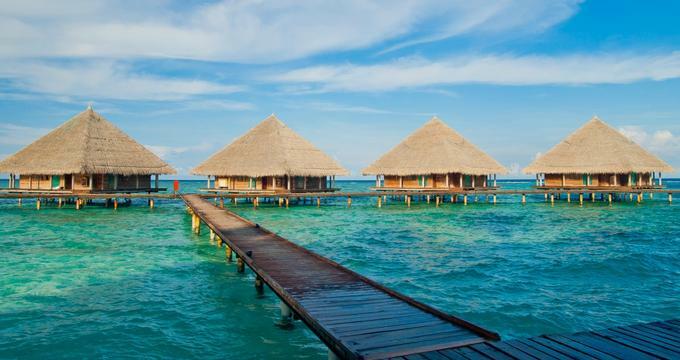 This beautiful resort consists of 20 overwater villas with private sun decks. All rooms have a minibar (with free items), espresso machine, flat-screen TV with a DVD player, and free Wi-Fi. Guests come from all over the world, and especially from Russia and other European countries. There are no children's facilities or babysitting services, so most guests are honeymooners or couples without kids. Centara Grand Island Resort and Spa is a family-friendly resort located on a small, secluded island. They offer various kids' activities as well as a kid’s club with a playground, all free of charge. Even the beachfront infinity pool has a shallow kids’ section. And while children are occupied by one of the many children's activities, parents can relax in an overwater fitness center or a deluxe spa (with steam room and hydrotherapy pools). Guests can also take advantage of a daily 30-minute massage, free of charge. For an extra fee, the resort also offers a private club with a restaurant and a pool. Centara Ras Fushi Resort and Spa is an adult-only resort, only a 20-minute speedboat ride away from Velana International Airport. Well-trained staff provides a top-notch service that caters to guests from all over the world. English, German, Arabic, and Chinese are just some of the languages spoken by the multilingual staff. Guests can enjoy some of many different water sports activities and excursions or relax in one of nine treatment rooms in a Thai-themed spa. Varied dining options are available, as is a 24-hour room service. All guests must be over 12 years of age, which makes this resort perfect for couples and honeymooners. Ellaidhoo Maldives by Cinnamon is located on a turtle-shaped island in the middle of the ocean. This Green Globe-certified resort combines luxurious living and top-notch service with a strong connection to nature. The dive site is open 24 hours a day and 365 days a year, and all visitors have to do is to put on some diving gear, jump in, and dive down to discover the beauty of the marine life. Dive & Sail offers many different water sports activities as well as all levels of PADI certification courses. Guests can enjoy the trip of a lifetime as instructors and guides lead the way to the caves, sea turtles, sharks, and whales beneath the waves. 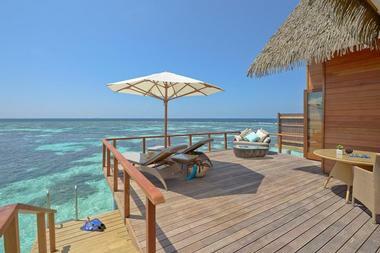 Fushi Resort is an eco-friendly resort with some cute villas built in the style of Robinson Crusoe. Guest will love its nature-inspired furniture and architecture, with raw wooden construction elements that make the rooms look like luxurious tree houses. This resort has received the Butterfly Mark, powered by Positive Luxury, as an acknowledgment of its commitment to social and environmental sustainability. The resort is geared towards families, but it attracts some celebrities, too. 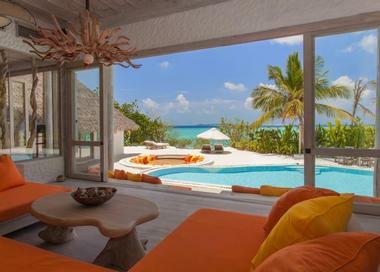 It’s no secret that Madonna and Paul McCartney are regular guests of this resort, and it's also rumored that Guy Ritchie and Kate Winslet have stayed here, too. 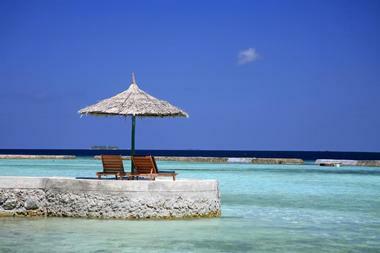 Gangehi Island Resort is a small luxury resort, located on a secluded and peaceful island. The resort's staff speaks several major European languages (English, Italian, French, Spanish, and German), as well as Arabic, Hindi, and Dhivehi. As an eco-resort, Gangehi tries to reduce power consumption as much as possible – all lamps are energy efficient and the air conditioning system also works as a water heater (which saves an average of 1,200 kW per day). Guests can join marine biology lectures during the evening and learn more about the history of the island and its marine life. Nature walks are also available once per week. 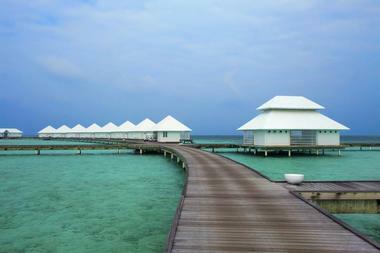 Hotels Maafushivaru is an all-inclusive luxurious hotel located on a small island that is only 350 meters in length. The entire length of the island can be walked in only a little more than 10 minutes! Free boat trips to Lonubo (a private sister island) are available each day. This uninhabited island is Maafushivaru’s best-kept secret. Just before the sun sets, the last boat goes back to the bigger island, so that when the night falls only one couple gets the opportunity to stay the night alone on the island. Dinner is set up on the beach for a perfect intimate atmosphere. Kandolhu Maldives is located on Kandolhu (formerly Kandolhudhoo) Island in the North Ari Atoll archipelago, which can be reached only by a seaplane, as there are no speed boat rides available. This perfectly shaped island will amaze everyone with its beauty – the white sand, crystal-clear water, and palms growing toward the sky create a picturesque view. The main focus is on relaxation and privacy, which makes this hotel the best fit for tourists seeking a peaceful and quiet atmosphere. An upper-level library lounge is a perfect place to enjoy panoramic views while reading a book. 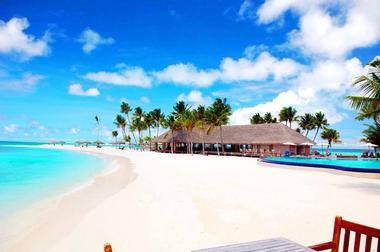 Kihaad Maldives is a resort located in Baa Atoll, a UNESCO World Biosphere Reserve. The island is accessible by flight or boat ride (flight is the more expensive option). Nightlife here is relatively limited, with a White Shisha Night once a week and a Bodu Beru Maldivian event and a sunset manager cocktail reception with free drinks on selected evenings. This, combined with the kids’ club, playground, and babysitting services, make this resort a perfect destination for families with children. In spite of that, the majority of guests are couples from Europe and China. 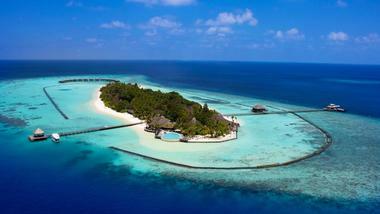 Komandoo Maldives Island Resort and Spa is the only resort on the island of Komandoo in the Lhaviyani Atoll. All guests must be over 18 years of age, making this resort one of the few adult-only resorts in the Maldives, which is perfect for couples who are looking for a romantic getaway. In 2009, it was ranked as the most romantic resort in Asia and the seventh most romantic resort in the whole world. And the resort certainly lives up to these titles, as guests will discover over a candlelit dinner on the beach. Each guest can choose between finest wines and champagnes and compose their own menu with the help of an executive chef. Kuredu Island Resort and Spa is another resort located in the Lhaviyani Atoll archipelago. Nearly 400 guest rooms are divided into three sub-resorts – Sangu, Koamas, and ‘O’ Resort. Each of these sub-resorts has its own bar, restaurant, and pool. Sangu Resort is an adult-only resort, while families with children over 12 are welcomed in the 'O' Resort. This award-winning destination offers a wide variety of activities for all its guests – there are children’s pools and occasional kids activities, as well as many water sports activities for adults, such as snorkeling, kayaking, and diving. Kurumba Maldives is the oldest resort in the Maldives and opened in 1972. After a complete reconstruction in 2003, the resort obtained the distinctive style and image it holds today, and now offers a wide range of luxurious, elegantly furnished rooms with wooden floors. With various activities, entertainment, and social events, Kurumba is an ideal place for guests of all ages. Tai chi, marine biology presentations, guided night snorkeling tours, canvas painting classes, and wine tastings in the lagoon are just some of many different activities this resort has to offer. Through numerous activities, Kurumba brings a traditional Maldivian experience to its guests. 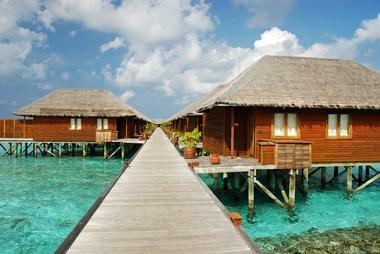 Lankanfushi Maldives is one of the top resorts in the Maldives. 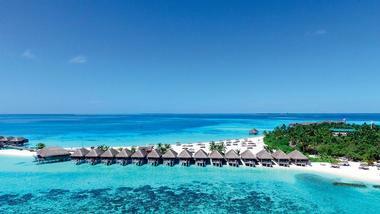 It was chosen as the number one luxury hotel in the Maldives and Asia by the 2017 TripAdvisor Travelers’ Choice. There is no better place to self-indulge than this rustic-luxe resort. Upon arrival, all guests get a free bottle of champagne and some canapés. Each guest has their own butler, called Mr. (or Ms.) Friday, like Robinson Crusoe's companion. Most guests come from the United Kingdom, Russia, and Asia, and there are a few from the United States. This once-in-a-lifetime experience may cost a small fortune, but it will be worth it! 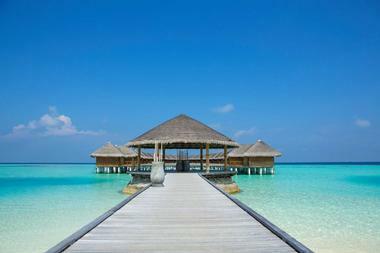 Maayafushi Resort is one of the most attractive Italian resorts of the Maldives. 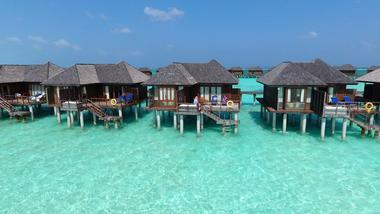 Overwater villas are available for all guests, except for children under the age of 10. In the resort's main restaurant, guests can try delicious Italian cuisine as well as international dishes. 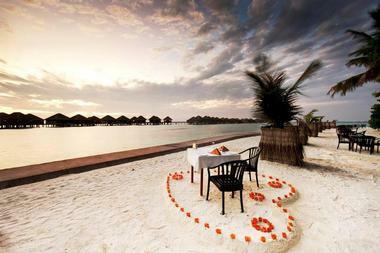 For an additional charge, an intimate romantic dinner can be set up on the beach. There are various activities available for all guests, many of which are free of charge. Guests can spend their days windsurfing, canoeing, and playing tennis or, for an extra fee, enjoy a relaxing massage (choose from Thai, Swedish, or Ayurvedic). Meeru Island Resort and Spa is the third oldest resort in the Maldives, and with nearly 300 rooms, it is also the third largest. This charming resort attracts guests of all ages (mostly Germans). There are more bars and activities than in some other resorts in the neighborhood. Honeymooners and newlyweds can relax in one of the Honeymoon Suites as well as in a romantic lounge and at an adult-only buffet restaurant. There are also two freshwater pools – one for adults and the other one for families. The adults' infinity pool overlooks the Honeymoon Suites. 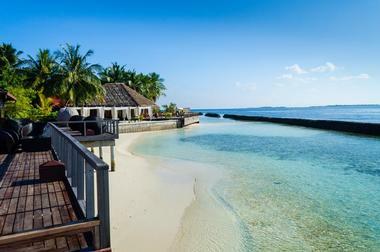 Olhuveli Beach and Spa Resort is one of many kid-friendly resorts in the Maldives. This resort has everything that families with kids might need – a children’s pool and playground, supervised kids’ activities such as sandcastle building and some craft activities, and babysitting services. Cribs and highchairs are also available for guests staying or eating at the resort. And while kids enjoy the many different facilities and activities geared towards them, parents can spend some much-needed free time in the Sun Spa. With a hair and beauty salon, steam room, sauna, hydrotherapy pools, and Jacuzzi, this spa center is the perfect place to relax. 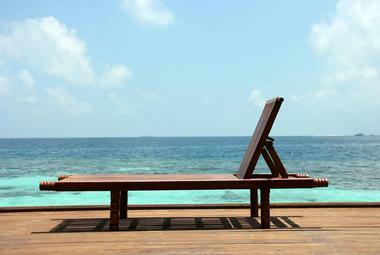 Prestige Vadoo is the most lavish of the five Adaaran resorts in the Maldives. It is only a 15-minute ride by speedboat from Malé International Airport, which makes it quite easy to access. 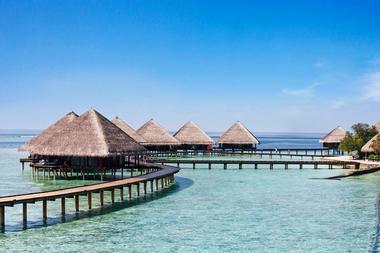 There are four types of water villas – Sunrise, Sunset, Japanese, and Honeymoon. Unlike some other resorts, Prestige Vadoo has a lively nightlife – small dance parties are hosted at the beach bar during the night. There are no children's activities and facilities at this resort, which makes it one of the best choices for couples and honeymooners who are looking for a romantic getaway. Taj Exotica Resort and Spa is a luxurious resort on Emboodhu Finolhu Island, centered in one of the largest lagoons in the Maldives. This tropical paradise is also known as the Three Coconut Isle. The National Museum is the perfect place for all guests to learn more about the Maldivian culture and history. Weapons, royal and religious relics, and some remnants of household items and clothes showcase the ancient and medieval periods of the Maldives. Another destination to be visited on the island is the oldest mosque in the Maldives, the Old Friday Mosque. This religious structure is made of coral stone and dates back to 1656. 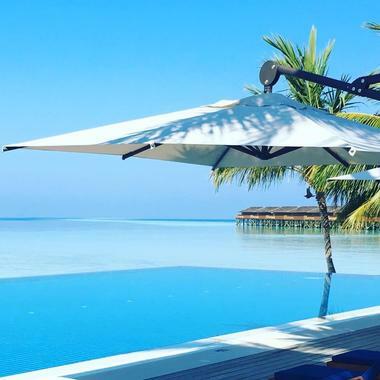 Thudufuhsi is another upscale all-inclusive resort, located on a small island in the South Ari Atoll, only 25 minutes away from the Malé International Airport by seaplane. All rooms fall somewhere between modern and rustic, with simple white furniture and unfinished hardwood floors. Bathrooms have rainfall showers, bidets, fluffy towels, and some organic products, but there are no mirrors. In this resort, all-inclusive truly includes all the things you might think of – food, drinks, minibar items, Wi-Fi, laundry service, use of non-motorized water vehicles, a guided snorkel tour with free use of snorkeling equipment, and a tour of the local fisherman's island. A free daily kids' program is also available. 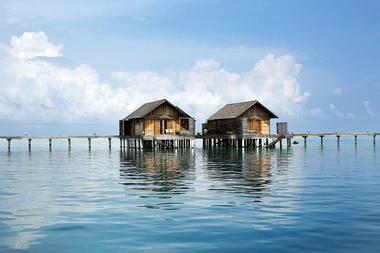 Veligandu Island Resort and Spa is one of the five Crown and Champa resorts. It was founded in the 1980s, making it one of the oldest resorts in the Maldives. Glowing underwater lights are placed at the bases of the Water Villas, which makes the water look illuminated and creates a beautiful, magical vibe. The resort offers a wide variety of both private and social activities for its guests. Most guests come from Europe, mostly from the UK and Germany. One really unique and fun aspect of this resort are the games, in which the staff play tournament games on a soccer field and guests get the opportunity to cheer on their favorite team. Vilamendhoo Island Resort and Spa is the only resort on the island of Vilamendhoo, South Ari Atoll. 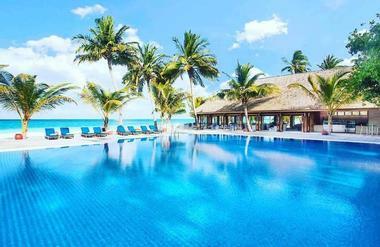 Like many other resorts, this all-inclusive resort also has two pools – a double-edged infinity pool only for adults, and a slightly larger family pool with a separate kids' pool in the vicinity. Children can stay only in the Garden Rooms and Beach Villas, while the Jacuzzi Beach Villas and Jacuzzi Water Villas are reserved only for adults. All adults-only facilities are for guests over 18 years of age. The hotel produces its own electricity and has a reverse osmosis water system for drinking water.